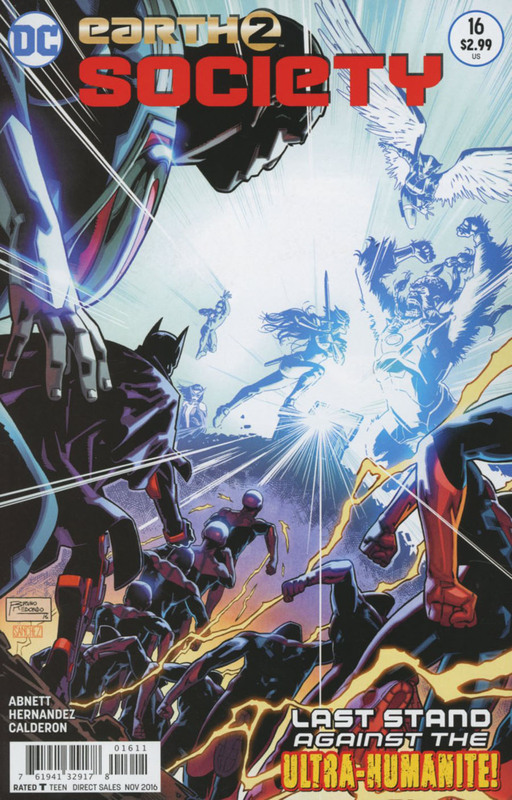 Green Lantern, under the control of the Ultra-Humanite, has beaten the most powerful Wonders on New Earth 2. Red Arrow, a mere human with a bow and arrow, gets through to Alan Scott by saying that it's the person that matters, not his or her powers. Green Lantern then imprisons himself in an energy sphere to prevent himself from harming anyone else. Feeling he no longer needs Alan Scott, the Ultra-Humanite and his army of enhanced children decimate the Wonders. A severely injured Fury sees that there's only one way to stop the Ultra-Humanite - open the Pandora Casket before he does. This brings about what appears to be the end of everything on New Earth 2. Will the Wonders be a wonder again? Will another world take the place of this one, or has Fury erased everything from existence? Well, according to DC Comics' solicitations for next month, there will be another issue of Earth 2: Society. Be here, Same Super-Time, Same Super-Site, for the answers to those questions and more Superfans. Knowing the Ultra-Humanite, who used his mental powers to escape the original Earth 2 with the refugees, is monitoring transmissions throughout the planet, Alan Scott contacts him in hopes of getting him to work together with the Wonders to create a civilization. Instead, the Ultra-Humanite controls Alan making him take back the Green Lantern ring and steal the Pandora Vessel. Wesley Dodds and Commander Soto are injured in the process. Power Girl urgently insists for someone to stop Alan Scott, for if he brings the Pandora Vessel to the Ultra-Humanite, New Earth 2 could face Armageddon. Will anyone be able to defeat the Ultra-Humanite and Green Lantern? Story - 3: I'll admit Dan Abnett's run on this book has been a good one, and this issue has a good story. However, by my standards of what he has written before, it's only good. Abnett has done better work in the past and on Earth 2: Society. The final chapter of this saga feels rushed. It's like someone said, "Hurry up, and move on!" somewhere along the way. This comic has been saved by Abnett's talent, but if the next issues are done in the way this one was, I don't see Earth 2: Society lasting much longer. Art - 4: Certain things that are far away in images look a little rough, and that can detract from the overall reading experience. I did like how characters and objects in the foreground looked. There just needed to be a little more work done for the art to be perfect. Cover Art - 4: I knocked a point off on this cover because it's a bit of a spoiler. Aside from that it's well done and has stunning art.